It's unclear from the book cover whether this was intended to be fiction or non-fiction. It turns out to be fiction, which was against my initial expectations. Knowing that, the book is not very engaging and is based on a bit of a strange premise involving anti-matter weapons. Nothing to see here. What an odd book! 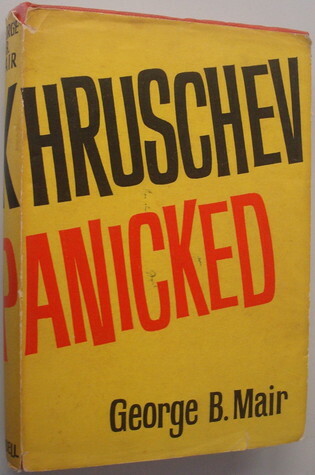 Part travelogue, part spy manual, part political debate about Democracy vs Communism, and all speculation about Khrushchev's failed plans to rule world. Mair wrote a series of spy novels after this book was published, but could any part of this tale be true? Will we ever know? George B. Mair - George Brown Mair was born at Troon in Scotland in May, 1914 and was educated at Kilmarnock Academy and Glasgow University, where he qualified as a doctor. He visited most European countries, Asia from Japan to Turkey, South America, the West Indies, Canada, the United States, and parts of Africa. With his Dutch wife Trudie, he visited nearly all the Communist countries in Europe, during the course of which they were the first to photograph the interior of the Kremlin palaces and met many Soviet leaders.